Why is the tank so important? Ask any tank installer what is the most important part of a sewage treatment system and he will tell you it is the tank. If the tank fails to perform, if it leaks water in or sewage out, if it distorts or cracks, then it doesn't matter what the sewage treatment process is, the system will fail. Over the past few years we have been saddened to see the quality of tanks sold in the UK deteriorate so much. We have had tanks from premier UK sewage treatment plant companies that were rejected by the Building Inspectors as they could see daylight between the top and the bottom half, tanks that were so thin in patches that you could see the shadow of someone walking past, through them, tanks which distorted the moment the concrete was poured, even when filled with water, MDPE (medium density polyethylene) tanks being sold for underground installation instead of the required HDPE (high density polyethylene) etc. etc. One of the problems is that the EN 12566-3 Test does not insist on tanks being tested for groundwater pressure performance. This test, believe it or not, is OPTIONAL, with the result that most manufacturers of weak tanks choose not to submit their tanks for it. The problem is really summed up in a quote from John Ruskin (1819 - 1900) "There is hardly anything in the world that some man can't make just a little worse and sell just a little cheaper; and the people who buy on price alone are this man's lawful prey". Cracking tanks - usually fibreglass. If a tank is cracked, it allows groundwater to pour into the tank. The flow rate through the tank is then too fast for the treatment process to work and the result is virtually raw sewage leaving the plant. See opposite - this tank is a leading brand of sewage treatment plant. It is new and it cracked as the drain-pipe was being pushed onto the spigot due to the poor quality of the fibreglass. The sides bend inwards under the pressure of groundwater, concrete, etc. reducing the working volume of the plant. This will then reduce its efficiency. The base of the tank bends upwards, again, reducing the working volume of the tank. If it has an aeration layer, as in the FilterPod, the aeration layer is then no longer in-line with the aeration inlets and outlets and the plant stops working. As soon as the tank starts to distort, the inlet and outlet holes change from perfect circles to ovals and the tanks leak water in from the groundwater as the seals/pipes no longer fit tight. 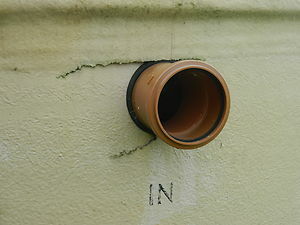 The spigots that the pipes fit onto bend downwards (see photo below) and either the drains 'back-up' as the gradients are ruined, or the pipe breaks off.. The neck distorts and the lids no longer fit. See the photo below. This yard is full of over 50 plastic septic tanks, installed as a whole village project, that had been installed less than 6 months. All of them have distorted due to groundwater pressure and all of them had to be taken out and replaced with better quality tanks. Never compromise on quality. You cannot make weak sewage treatment plant tanks stronger by surrounding them in concrete - it is a myth - Click here to find out why. A lot of the market-leading tanks now only have a 12 month tank warranty. In our opinion, this is unacceptable. The FilterPod tank has a 10 year warranty. 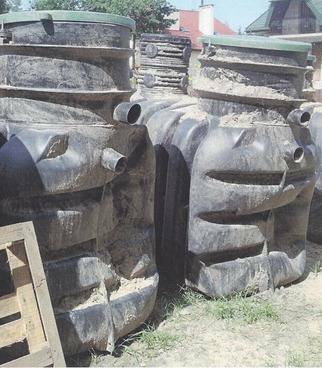 Any tank, no matter how poor the quality, material or design, CAN be installed in high groundwater conditions if the installation is site-specifically designed by a civil engineer. The problem arises when you use an average tank installer who installs it the same way that he has installed every other tank in lower groundwater sites. He doesn't read the specific high groundwater installation instructions, which usually tell you to have the install designed by a professional engineer. As no-one rushes to spend another £1000 on this, the homeowner usually relies upon the installers knowledge and when things go wrong, they are in trouble. Here at PodTanks, we decided that we wanted a better, stronger tank than anything else on the market, one that, for all usual UK ground conditions, could be installed by a competent groundworker without the need for engineering help. We wanted a tank that was strong enough to stand up to UK groundwater conditions on its own - even in The Fens and Somerset Levels, where groundwater can get as high as ground level. The only way to ensure tank quality was to design and and manufacture it ourselves as we could not find such a tank for our filter system in either the UK or Europe. The design phase alone of the FilterPod tank cost £20,000 and we are very proud of it. The FilterPod tank can be installed in either high or low water table sites, it will not bend or crack and can be installed by any competent installer in all standard wet or dry site conditions with a 10 year tank warranty.